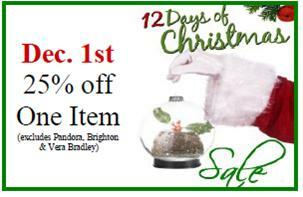 12 Days of Christmas ~ Dec. 1st! 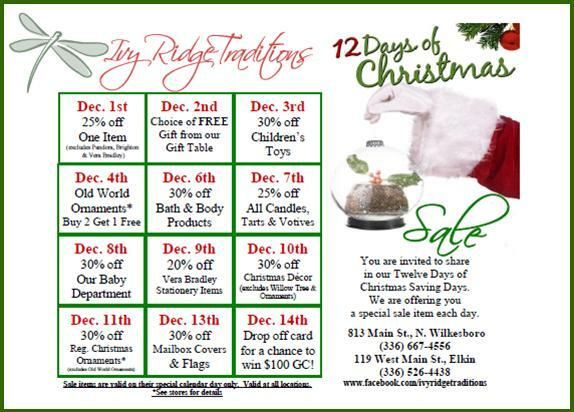 12 Days of Christmas Sale ~ Mark Your Calendars! Free Tote with $100 or more Vera Bradley Purchase ~ Black Friday! Welcome BLACK FRIDAY and all the deals that come with it! 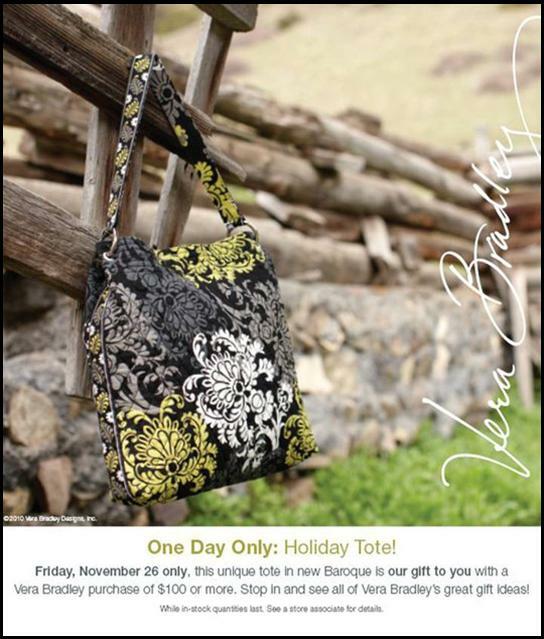 Today is the day to received a FREE Holiday Tote in Baroque (my favorite color right now) with any $100 or more Vera Bradley purchase. This tote could be a gift in itself, because it is VERY nice. If you have someone on your Christmas list who has wished for Vera Bradley today is the best day of the holiday shopping season to purchase it! 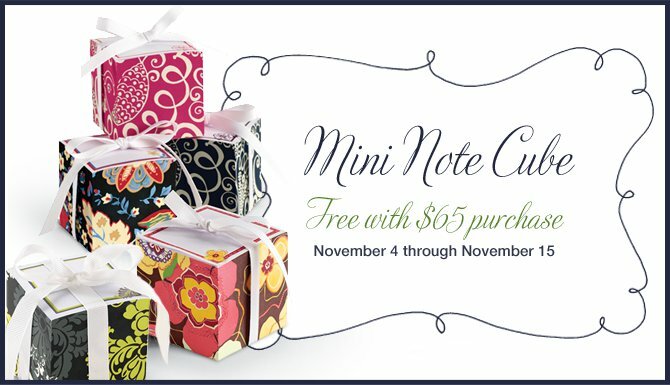 Retiring Vera Bradley Goes on Sale Today! November 24th! Today is the first day of the retirement of Java Blue, Blue Rhapsody, Imperial Toile & Totally Turquoise, so stop in the for best selection at 30% OFF! 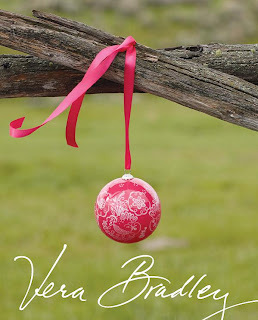 Hey, and Vera Bradley.com only has it at 25% off! All I Want for Christmas? Complete a IRT Wish List! Christmas shopping has begun! 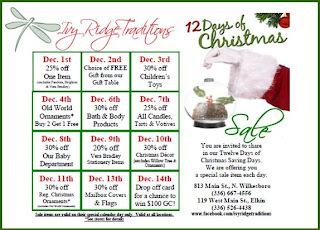 Is there something on your wish list from Ivy Ridge? Then stop by one of our shops to complete a wish list, so when your friends and family stop by we can share exactly the items that you would enjoy. 1. Stop by and fill out a Christmas Wish List. 2. Would you like us to mail a note to your spouse or parents? 3. Just give us their address and we will let them know you have a wish list with us. 4. You can simply make shopping easy for those who care about you. You just have tell them! 15th Annual Light Up Downtown ~ Friday, Nov. 19th at 5:30 pm! Please us for the evening as Historic Downtown North Wilkesboro presents the 15th Annual Light Up Downtown Celebration to be held on Friday, November 19th from 5:30pm – 9:00pm in Downtown North Wilkesboro. The theme for this year’s event is “Oh, Christmas Tree”. Santa will be downtown from 5:30pm – 9:00 pm in the lobby of Wilkes Towers to listen to all your Christmas wishes. Remember to bring your camera for pictures. Hayrides will also be available to ride around the downtown and enjoy the Christmas lights and decorations. Pick-ups will be at Melody Square and the Wilkes Art Gallery In addition, there will be lots of food, crafts, and merchandise vendors lining Main Street. Don’t forget to get a jump on your holiday shopping, as several Downtown Retailers will be open late to help you kickoff your Christmas shopping. Liberty Theater will also be open showing the first installment of Harry Potter and the Deathly Hallows. There will be two stages of entertainment. The first stage will be on 9th Street and the second stage will be at Melody Square on 6th Street. Various singing and dance groups will be performing. Mayor Robert Johnson will be on the 9th Street Stage at 6:00pm to flip on the Christmas Lights. New Fall 2010 Pandora Beads Have Arrived! 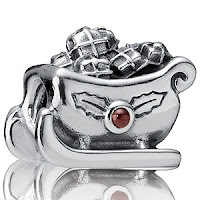 These are a couple of my favorite new Pandora beads that have just arrived at the North Wilkesboro shop! 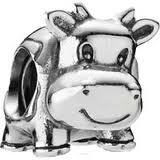 We also have new pendants and rings in stock. Be sure to look at our Stories Collection of rings where you can mix and match and stack rings to make exactly what you would enjoy. Kameleon Jewelry Trunk Show ~ This Week! Kameleon Jewelry is the world’s first, patent pending, sterling silver jewelry collection that offers interchangeability and with the motto, "Change is Natural." the sky's the limit (well almost) to the color versitility you have with a piece of Kameleon Jewelry. For example, purchase a ring and three JewelPops and you have three rings! It is simple. The JewelPop (the colored center) can be removed and you just pop in another pop for a totally different look. Stop by the shops during our TRUNK SHOWS! See the details below! Pops! Pops! Pops! Two new great ring styles! New Pendants! Lots of rings in all sizes! Limit one per customer over the two day period and WHILE SUPPLIES LAST. 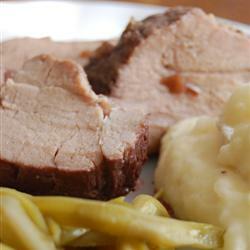 What's in My Crockpot Today? Note: If you want less salt, I would recommend using half a pack of the dry onion soup mix and low-sodium soy sauce. If you make this tenderloin, please come back to the blog and tell me how it turned out in the comments section. 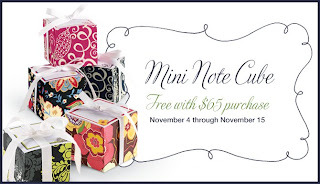 November Blog Buddies Coupon ~ Online Now! 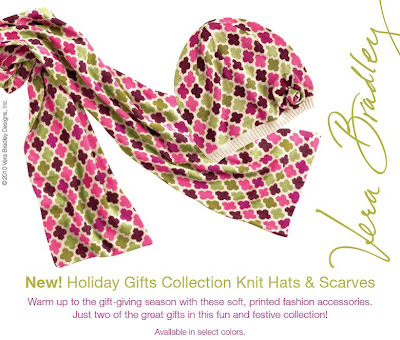 Vera Bradley Holiday Gifts Are Arriving ~ November 4th!